Ferrari took longer than their British rivals to recognise the advantages of putting the engine behind the driver. 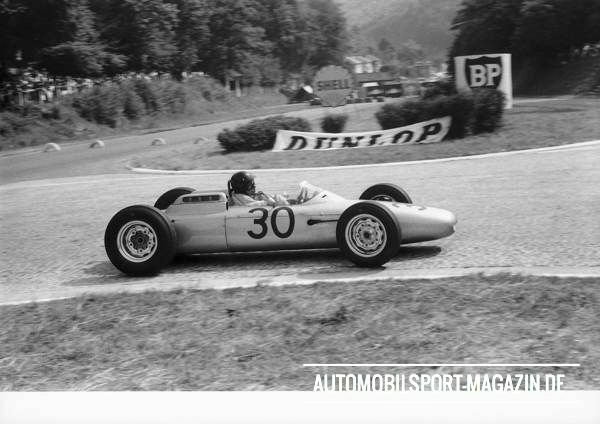 But after their 1961 Formula 1 success with the rear-mounted V6, chief engineer Carlo Chiti set out to introduce the concept in the sportscar sector as well. He did so with the mid-engined 246 SP. 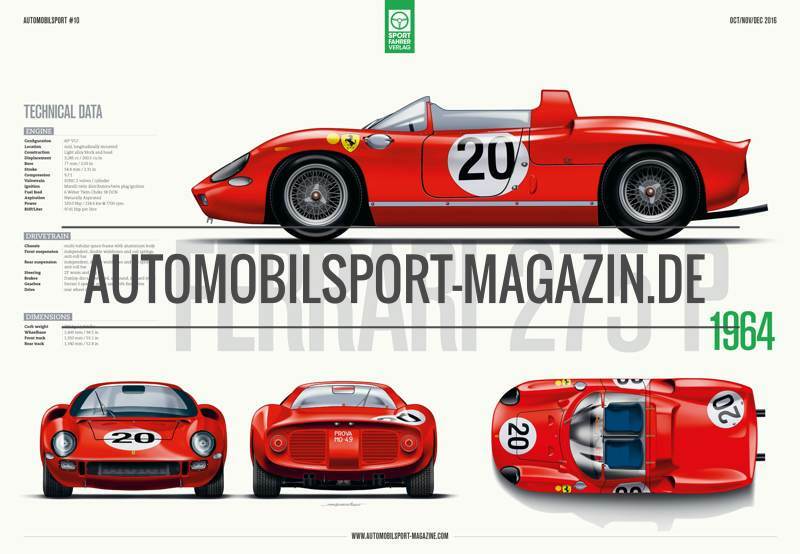 After decades of the great Italian tradition of glorious front-engined racing cars, it was extremely difficult for Enzo Ferrari to accept the necessity to go rear-engined. 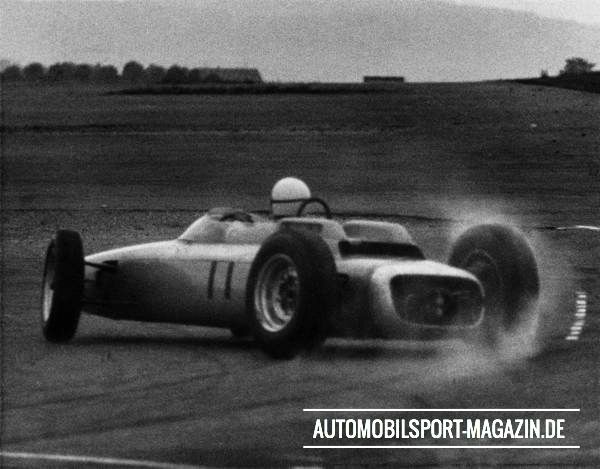 He was the last of the Formula 1 brigade to make the change in 1960 and ’61. Ferrari did it with V6 engines, compact units that were ideally suited to being placed between the driver and the rear wheels. Traumatic though the change was for the Commendatore, it was ultimately a successful turnabout. 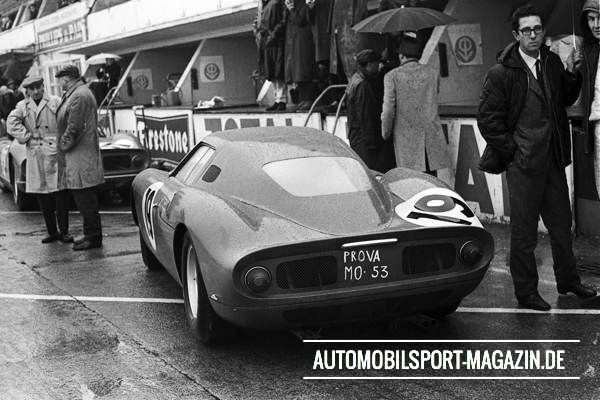 Then it was logical to build sports-racing cars with the same V6 engines in the rear, which Ferrari hastened to do. 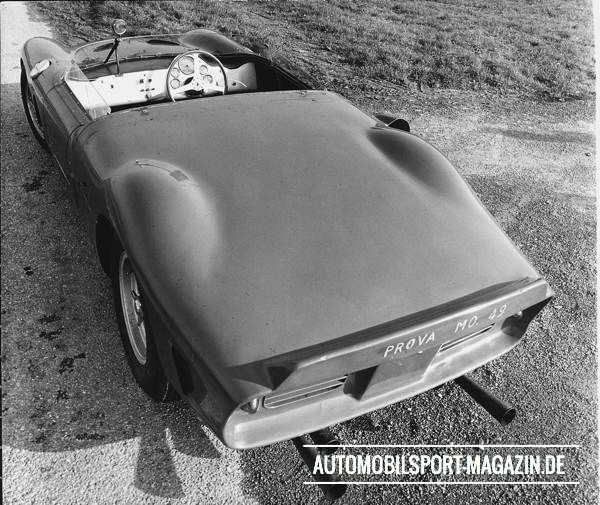 The first of these was the mid-engined 246 SP sports-prototype, designed under Ferrari chief racing engineer Carlo Chiti. 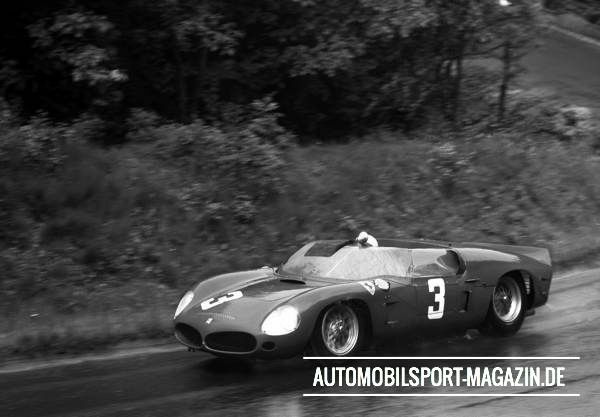 Powering it was the same 2.4-litre V-6 that Ferrari used in its 1960 season Formula 1 cars, slightly detuned for endurance. 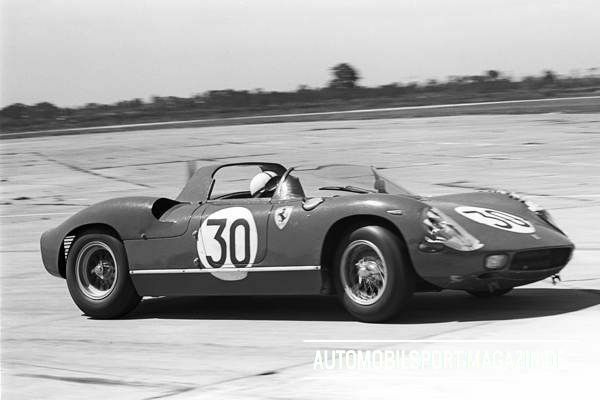 The first 246 SP was tested at Monza in mid-March of 1961 before its first race, the Sebring 12-hour contest. Another factor could have been instability caused by the more forward centre of pressure of the fully enclosed body. The 246 SP was equipped with a single small fin to counter this. The car was tested with additional fins, but these offered little help. 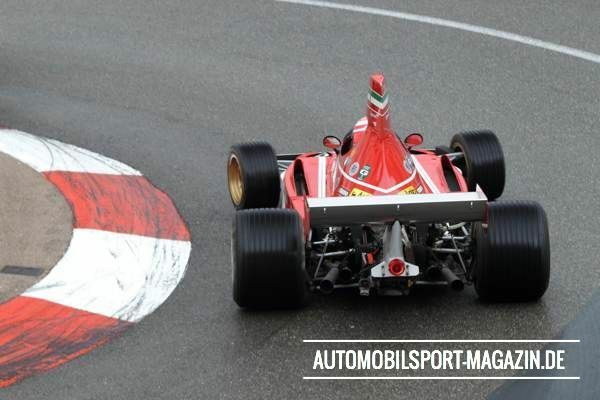 With its tail completely removed, the 246 SP was slower on the straights, but much faster through Monza’s bends. What was the answer? Working as their name suggested, the devices were intended to “spoil” or break up the airflow that seemed to be generating lift over the rear panels of the body. Although perfectly well understood today, this was a revolutionary idea in 1961. After the successful trials with the 246 SP, Maranello upgraded its sportscars to 12 cylinders. Moreover, Ferrari's aerodynamic research bore fruit just in time for the new racers, the development of which was overseen by 27-year-old Mauro Forghieri. “I was sure it would be successful,” Forghieri said about the mid-engined V12 sportscar project, “and proposed we build a car with a rear-end weight of no more than 55 percent of the total.” This first V12 engine swap was made late in 1962. It used a 268 SP body and chassis with its wheelbase stretched by about three inches in the engine room, from 91.4 to 94.5 inches. 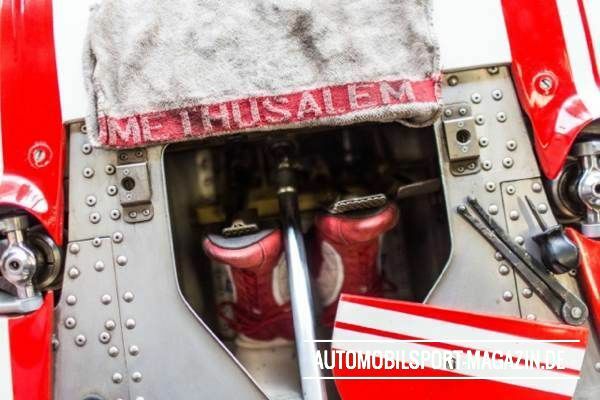 A dry-sump version of the veteran three-litre V12 was installed and fitted with a shorter exhaust system, which to everyone’s amazement produced five more horsepower instead of the expected reduction. 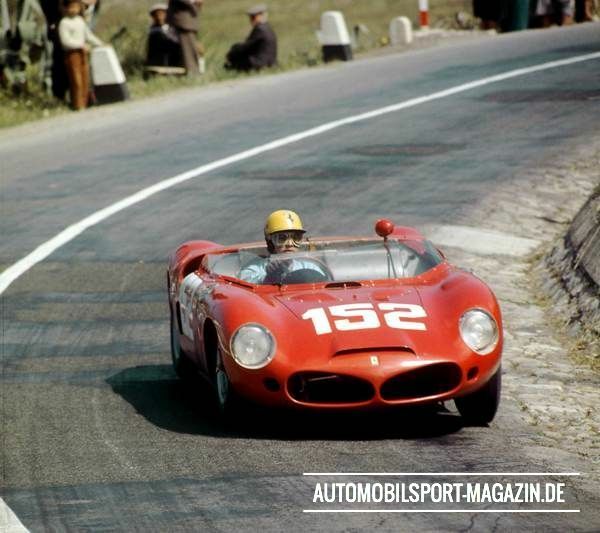 “It was a bit of a gamble,” Forghieri admitted, “but in the meantime, John Surtees joined us. He was a driver of tremendous technical lucidity. He supported me, as did team manager Eugenio Dragoni.” Another asset was the recent arrival of British engineer-driver Michael Parkes, whose suspension knowledge helped make the new combination work without major alteration to the car’s straightforward parallel-wishbone suspension dating from the Chiti era. 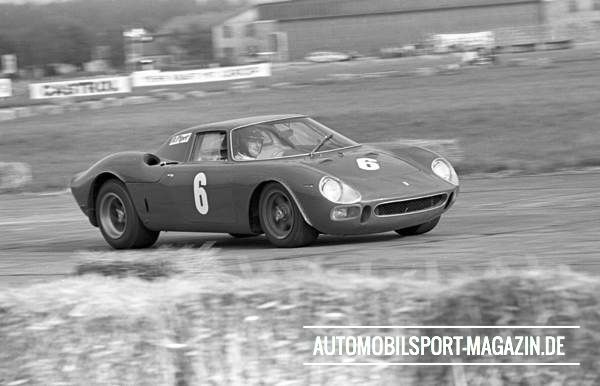 The resulting 250 P, as the new open GT Prototype was designated, gained a reputation for remarkably good handling. 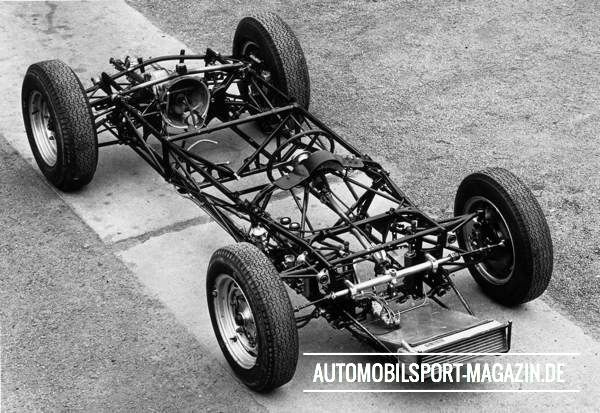 Surtees described it this way: “Light throttle gives understeer characteristics and the suspension is designed to use tyres that allow changeover from understeer to oversteer. The car is a little heavy on a slow corner, so you go to the apex of the corner in understeer and change to oversteer. 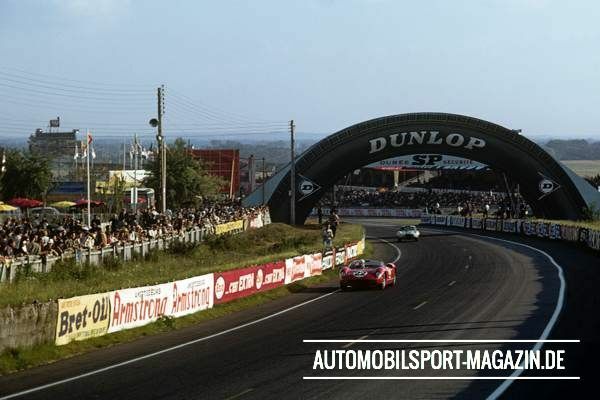 It is very stable at high speed, but does tend to weave a little when there is a crosswind.” Its stability was specially evident at Le Mans, where the 250 P was timed at 180 mph, generally without drama. 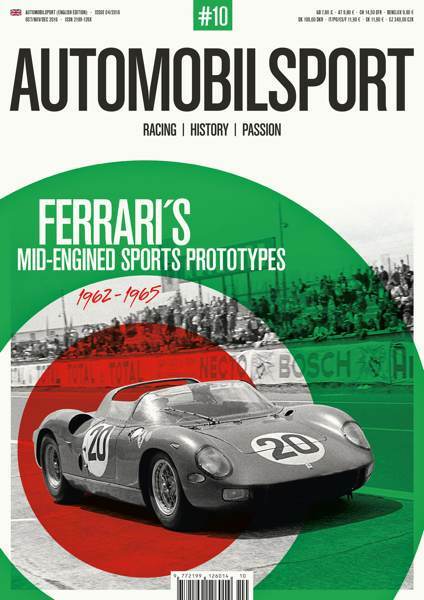 Weight of the 250 P was up to 1,670 pounds from the 1,450 of the preceding year’s sports-racing cars, not only because the engine was slightly heavier, but also because Ferrari made this a genuine prototype with a carpeted and trimmed interior, curved-glass windscreen and deep, full-width instrument panel including a glove compartment. A few well-placed scoops replaced the earlier multiple slots and vents while the double-nostril air entry, a Chiti trademark, was replaced by a single rectangular scoop flanked by brake-cooling inlets and driving lamps. The cars ran both with and without Plexiglas fairings over their doors, depending on how bad conditions were in the hot, poorly ventilated cockpits. 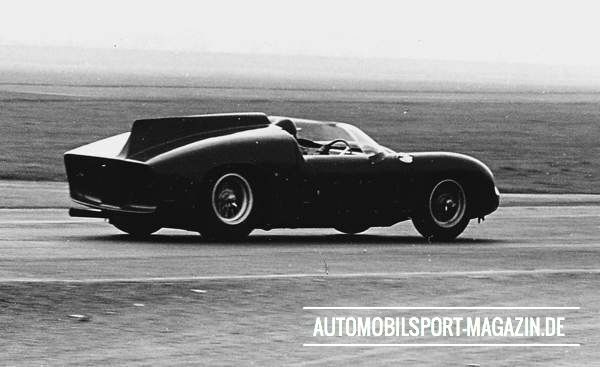 Aerodynamic research work begun in 1962 by Mauro Forghieri matured in good time to be of benefit to the new mid-engined Ferrari sports-racers. The regulations for Le Mans required a full-width windscreen. 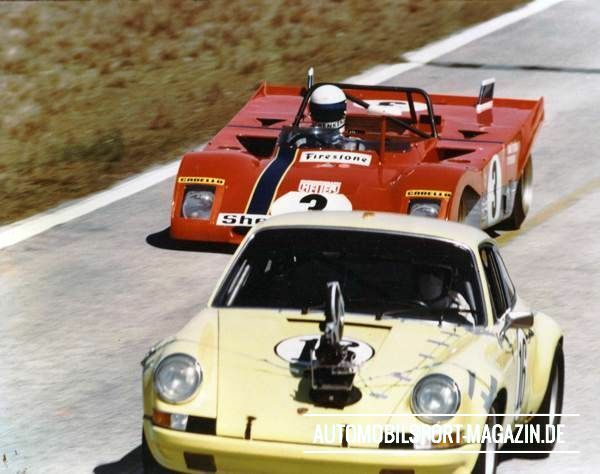 For Ferrari’s open cars, this posed a new aerodynamic challenge, especially for the Sarthe circuit whose long Mulsanne Straight put a premium on high speed combined with stability. In 1961 Chiti’s solution had been high rear-deck surfaces with tail spoilers, but their stability was doubtful. 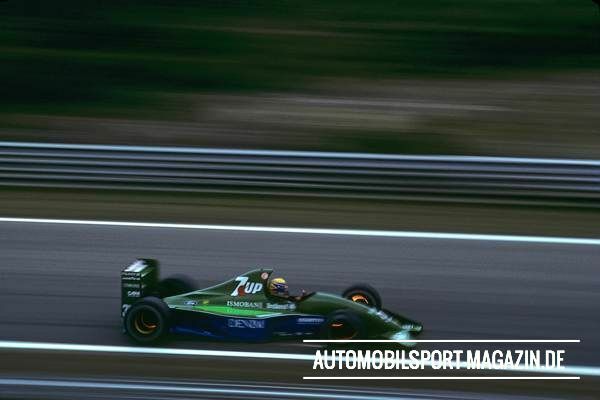 When talking about great designs, Grand Prix cars of the 1990s will hardly make it on top of the list of any F1 expert. There is, however, one exception. 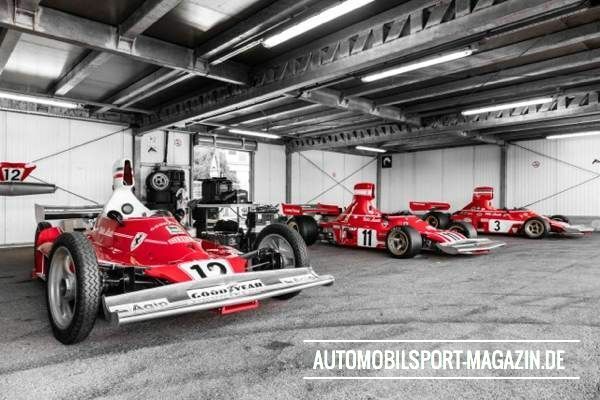 This car never won a race, but its beautiful appearance and the thrilling story behind it do justify its status as a true classic: the Jordan 191. 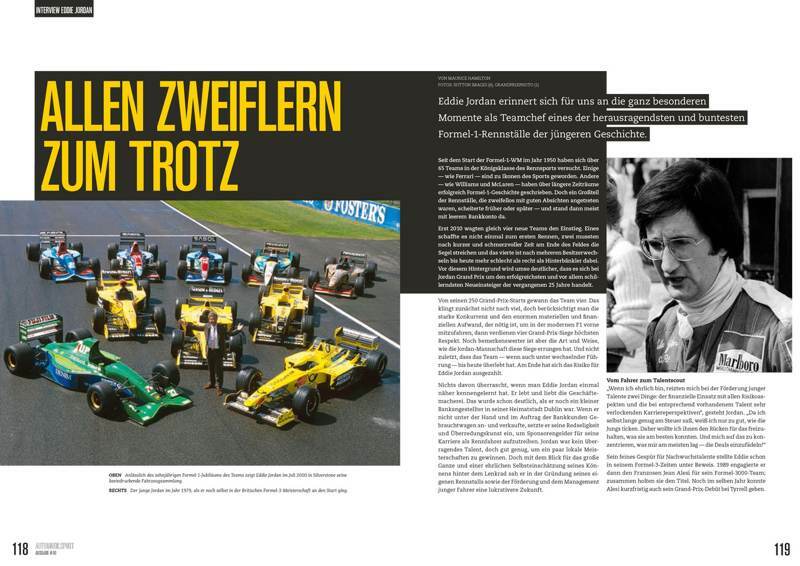 In the last issue of AUTOMOBILSPORT, Ian Phillips looked back on the team’s beginnings and the first half of its debut Grand Prix season. 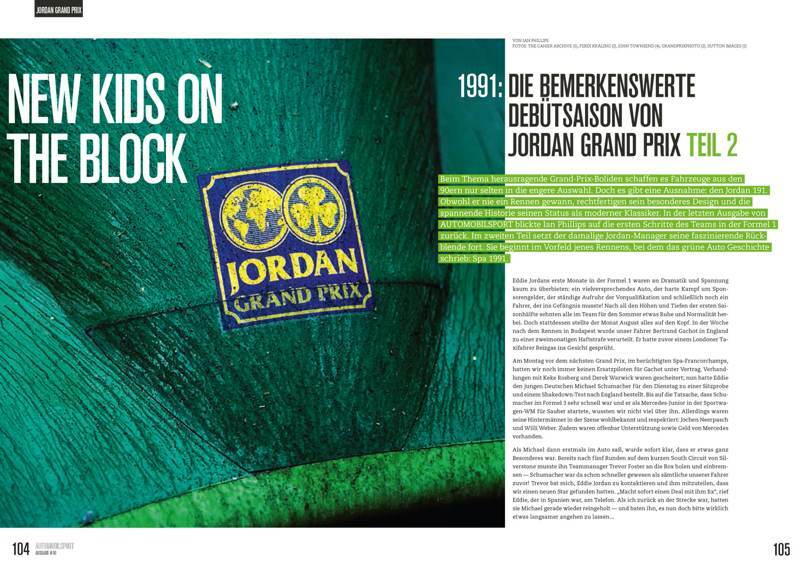 This time the former Jordan Commercial Manager continues his fascinating story with the build-up for the event where the striking green car would make history: Spa 1991. 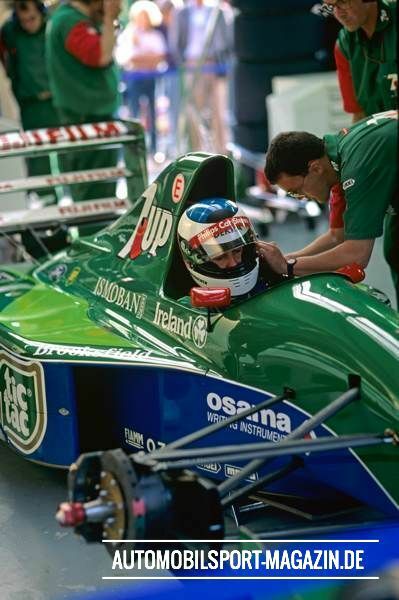 The beginning of Eddie Jordan’s Formula One adventure had it all: an extremely promising car, a hard fight for sponsorship, the drama of pre-qualifying and a driver ending up in prison! With all the excitement in the first half of our debut season 1991, we were expecting things to calm down during the summer. But instead the month of August would turn everything upside-down. Little did we know that we’d soon be part of something absolutely outstanding. 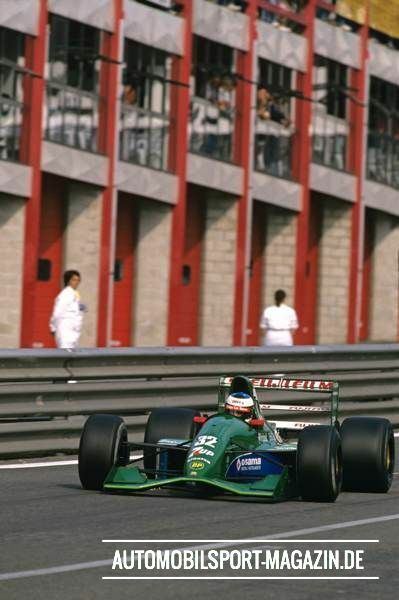 In the week after the Hungarian Grand Prix, our Belgian driver Bertrand Gachot was imprisoned in Britain following an incident in which he sprayed CS gas at a London taxi driver. 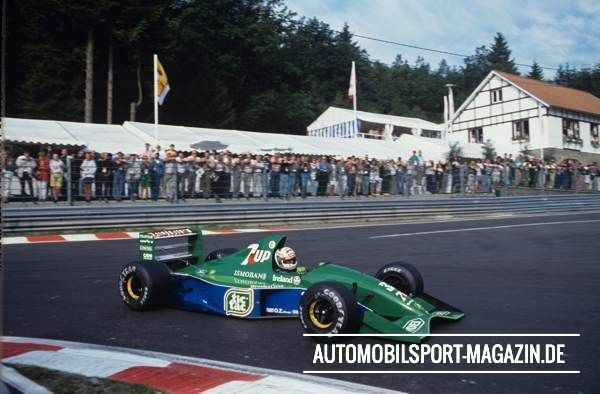 On the Monday before the next race, the Belgian Grand Prix at the classic Spa-Francorchamps track, Jordan still had no replacement driver for Gachot lined up. 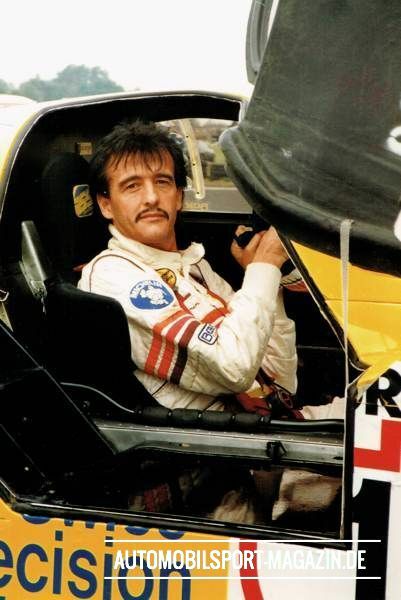 After failed negotiations with Keke Rosberg and Derek Warwick, Eddie had arranged for young German Michael Schumacher to come over to Silverstone on Tuesday for a seat fit and a shakedown test. None of us had heard much of Michael, apart from the fact that he was quick in Formula 3 and now a Mercedes sports car junior driver. 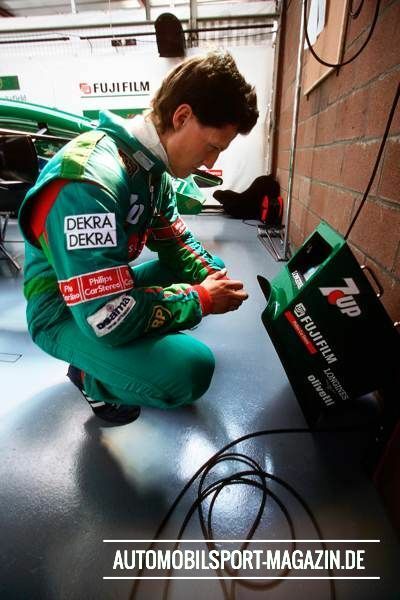 Anyway, Schumacher was looked after by Jochen Neerpasch and Willi Weber, both of them well-known and respected, and apparently there was a budget from Mercedes. 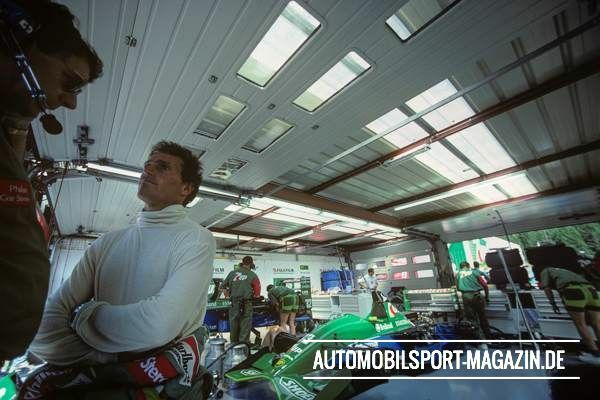 However, when we arrived at Spa two days later, we still hadn’t agreed Schumacher’s contract. Jochen Neerpasch was negotiating the deal on behalf of Mercedes. 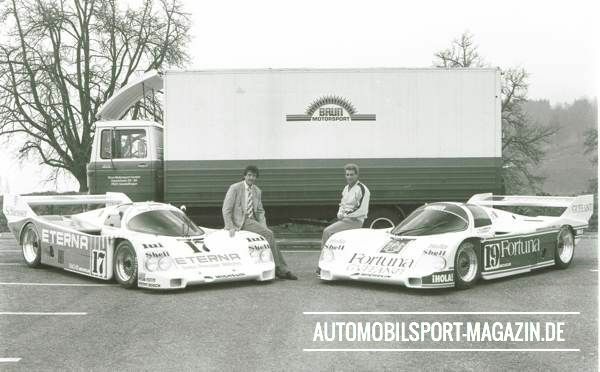 Essentially the plan was for Mercedes to pay us £150,000 per race for the rest of the 1991 season with a three year deal to follow at £3, £3.5 and £4 million a year. We had provided Neerpasch with the draft contract, but by Thursday afternoon – the day before practice started – this still wasn’t signed. 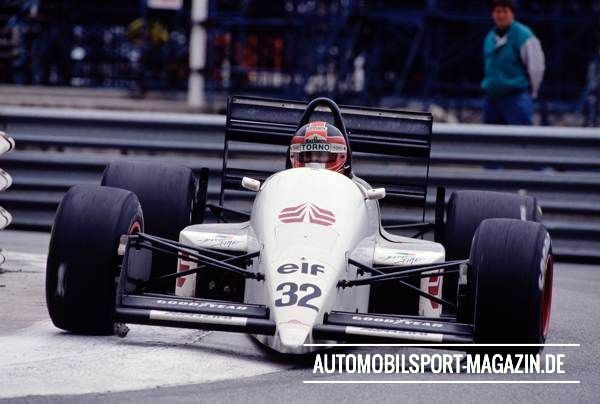 Eddie, travelling to Belgium from Spain, said if the contract wasn’t signed by 6 pm on Thursday, then Stefan Johansson would be in the car instead of Schumacher. Eventually Neerpasch agreed after persuading our lawyer Fred Rogers to accept that they would sign “a” full contract rather than “the” full contract before the next race, the Italian Grand Prix at Monza. With this statement from Neerpasch, we thought we were sorted and therefore gave the green light for Michael to get in the Jordan No. 32. 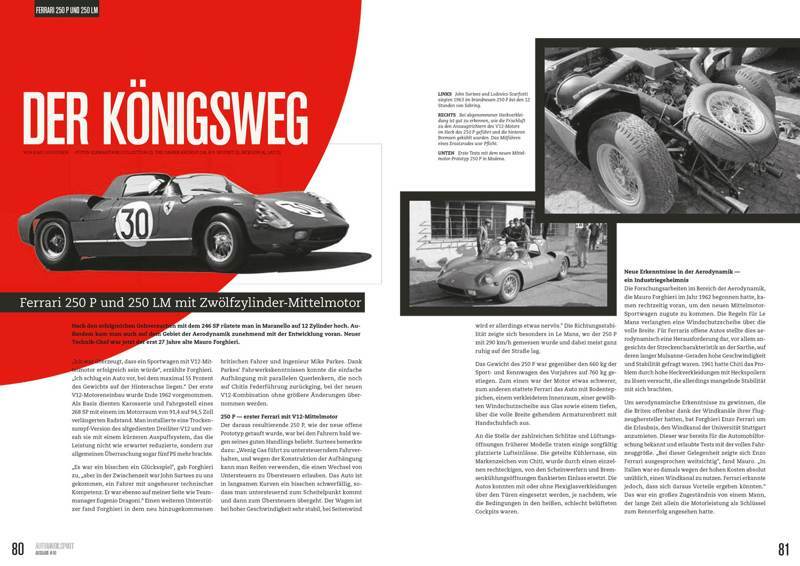 It was only a few short days before the outing at Monaco that the eight-month restoration of the Porsche 804 reached its completion. Quite a lot of effort, really, for a Formula 1 car that was only ever raced for a single season. That shrill sound of the early 60s, though, blasts all thoughts of doubt away. It’s a powerful sound coming from such a small car, and it gives cause for the crowd standing in the Monaco pitlane to take a couple of small steps backwards. The car’s beating heart – the small, ultra slim eight-cylinder boxer engine – is ready to go. 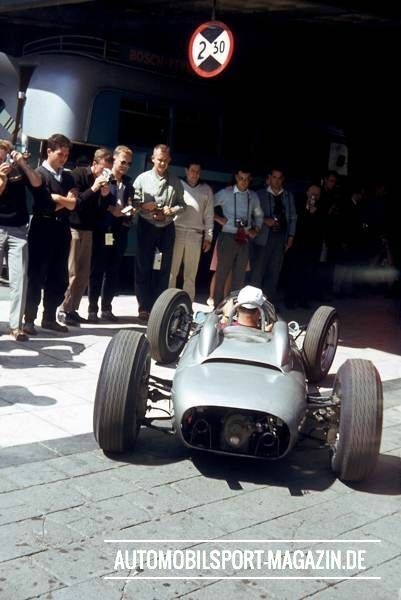 It’s the car’s second time in Monaco, 54 years after its first. 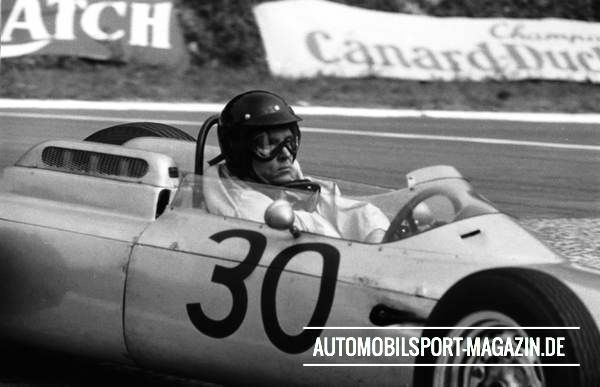 Back then, American driver Dan Gurney was in command of the silver, 180-horsepower strong F1 car. 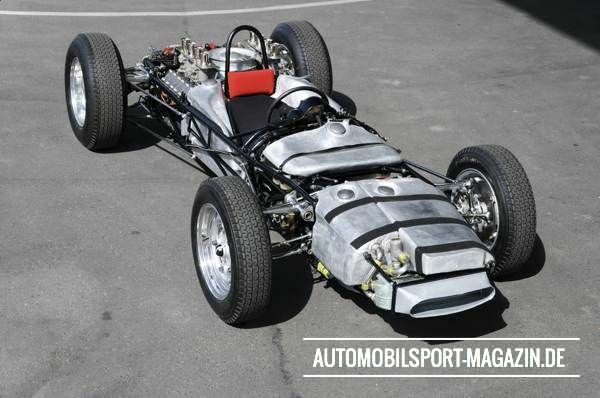 These days Gurney is 85 years old, and probably wouldn’t be too comfortable crammed into a tiny single-seater like this. This time it’s former Porsche driver Jacky Ickx who watches the rev counter needle spring into life as he hits the throttle. 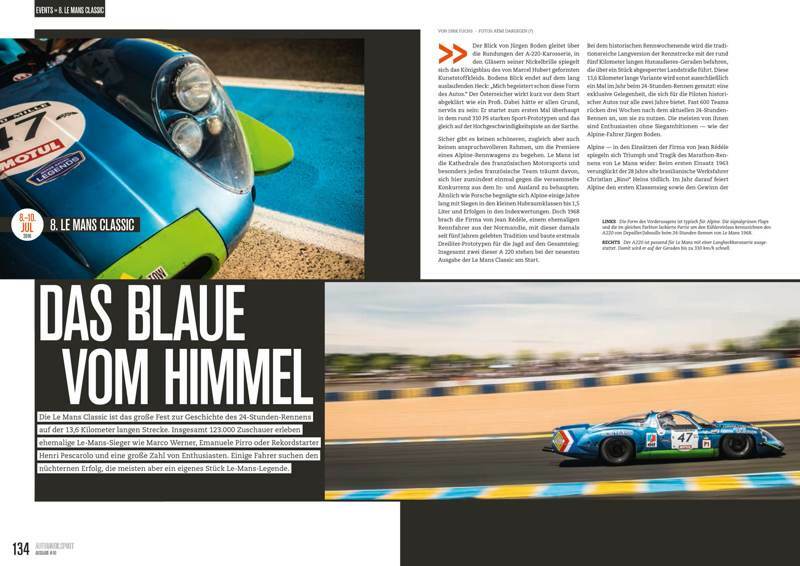 The seven-time Le Mans winner is about to take part in the first demonstration run for the 804 at the 10th Grand Prix de Monaco Historique – just a few days after the restoration of the car was finished. 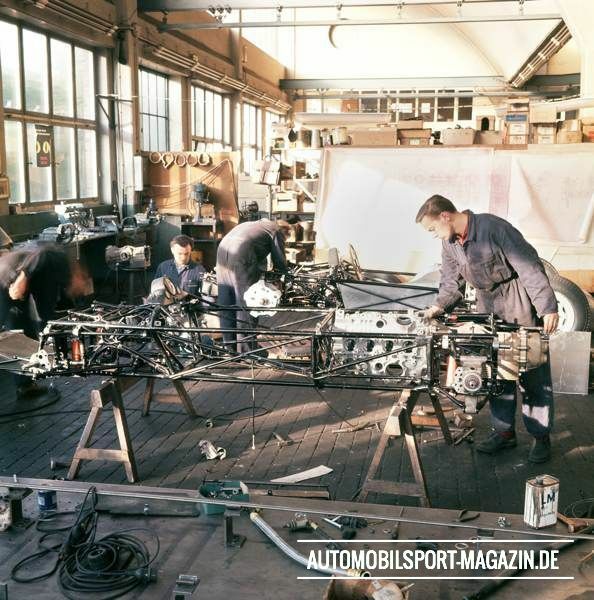 It took eight months of work from the in-house workshop at the Porsche museum to restore the 804, and as Porsche’s only complete F1 car it was done with particular care… even if it’s a car that will go down in history as a racer that never quite delivered what the Porsche head honchos at the time had hoped it would. The car was only given seven World Championship races to take the fight to the British teams like BRM, Lotus, and Cooper. But there was only one points-paying win, Gurney taking the French GP victory away from Rouen-Les-Essarts. There was also a pole at the team’s home Grand Prix at the Nürburgring, and a non-championship victory at the Solitude race near Stuttgart. Gurney finished the season fifth in the points, with his Swedish team-mate Joakim Bonnier down in 14th. 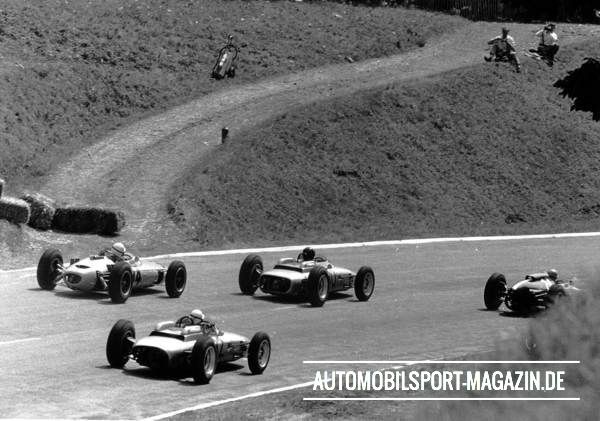 The team finished fifth in the constructors' table as well, locked on points with 1961 World Champions Ferrari. Porsche never actually officially announced that it was ending its F1 programme, and all four cars survived despite the exit. 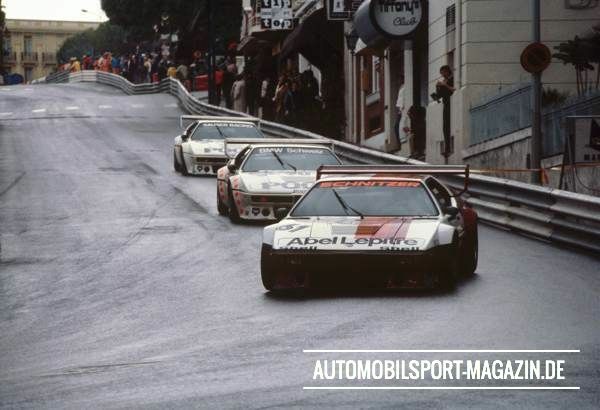 But their history beyond that is the stuff of speculation, particularly for chassis 804-01, the car Jacky Ickx is about to drive out of the garage in Monte Carlo. 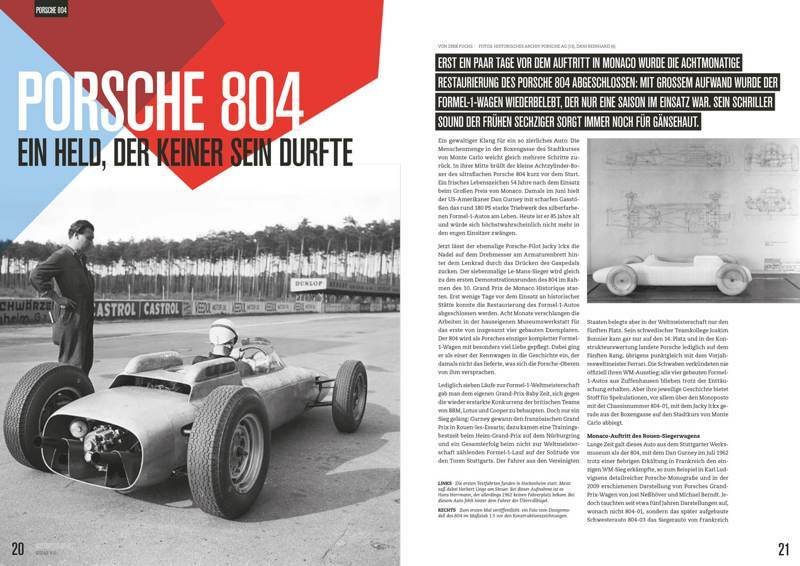 For a long time it was taken as fact that 804-01 was the car in which Dan Gurney won the French GP back in ‘62, particularly after it was recorded in the likes of Karl Ludvisgsen’s Porsche monograph. 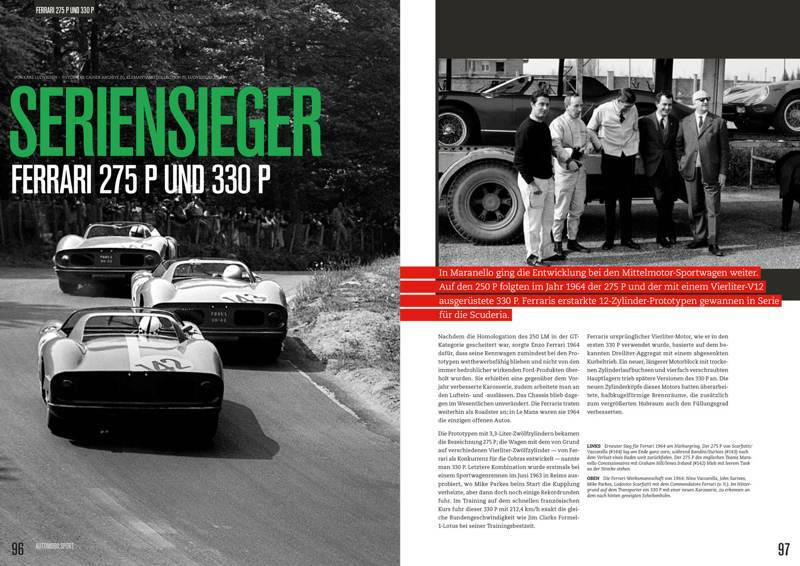 However, around five years ago suggestions emerged that it was in fact 804-03 that Gurney took to the historic win, as written, for example, in Steve Heinrich and Rolf Sprenger’s 2014 book ‘Carrera’. 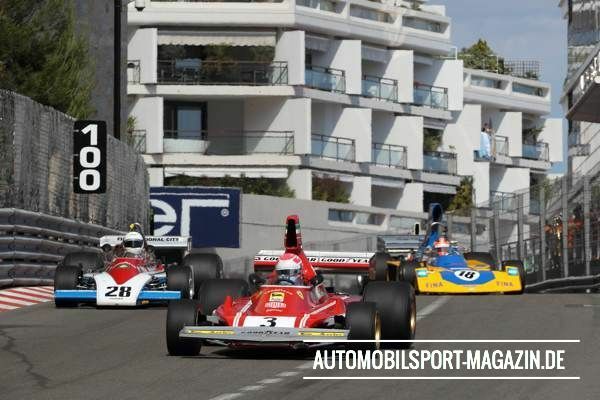 The Grand Prix de Monaco Historique is a special occasion for every single participant. 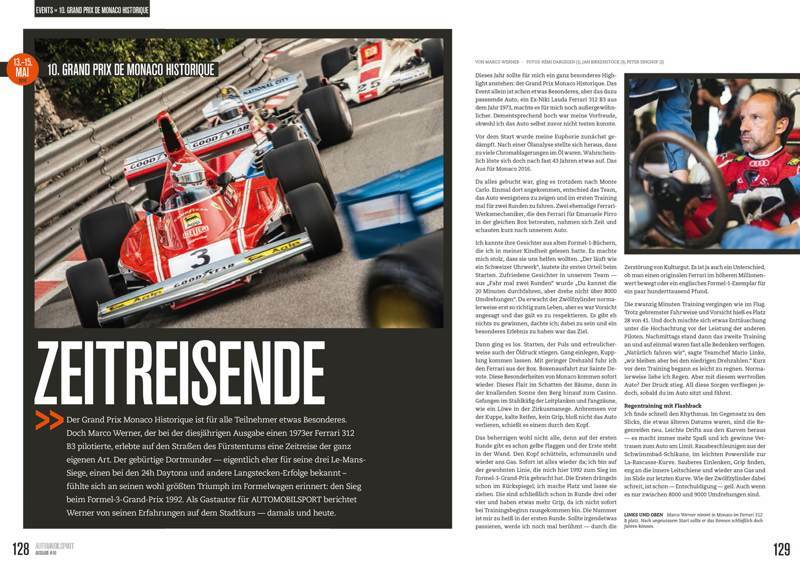 But Marco Werner, who drove a 1973 Ferrari 312B in this year's edition, experienced a veritable journey back through time. 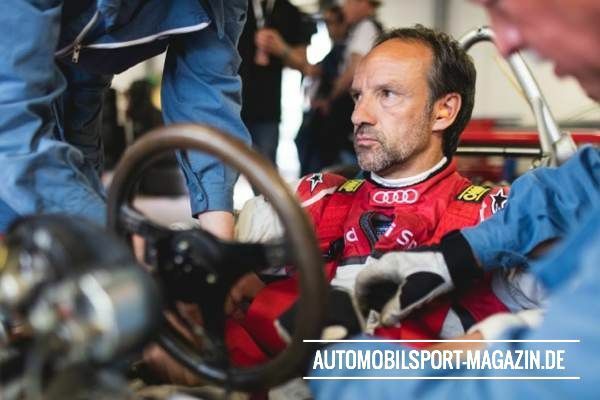 The German – best known for his exploits in endurance racing including three Le Mans wins and one at the Daytona 24h – relived his biggest open-wheel triumph: victory in the Formula 3 Grand Prix of 1992. 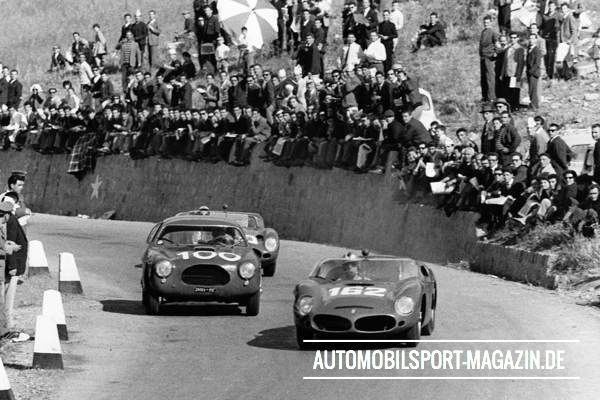 As a guest author for AUTOMOBILSPORT, Werner recounts racing in the streets of the Principality – then and now. It was all set to be my absolute highlight of the year. 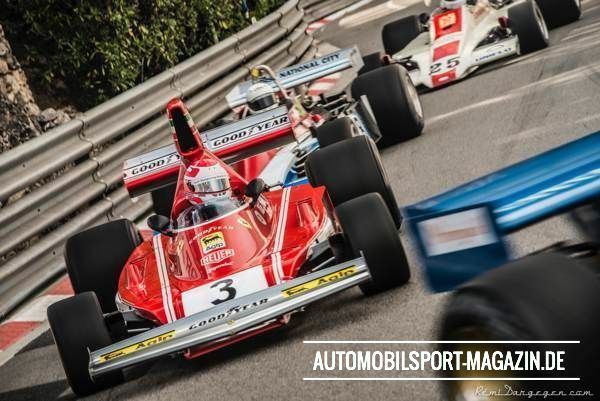 The Grand Prix Monaco Historique is always something special, but this year, with an ex-Niki Lauda 1973 Ferrari 312B at my disposal, it was shaping up to be even better than usual. Despite not having the chance to test the car before the event, I was very excited as we went through our preparations. But my excitement was quickly dampened in the build-up; an analysis of the oil showed up too many chrome deposits, a sure sign that something was broken inside the 43-year-old engine. Monaco 2016 seemed to be over before it had even started. Given that everything was already booked, the team decided that we should head to Monte Carlo, anyway. We could at least show the car, the reasoning went, and do a couple of laps in practice. 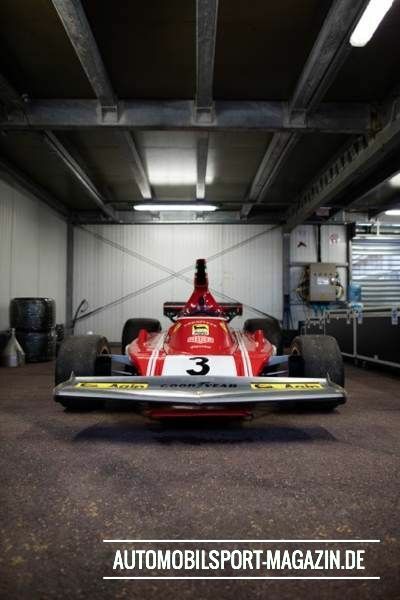 There, two former works Ferrari mechanics who were looking after Emanuele Pirro’s car in the same garage took a quick look over the 312B. 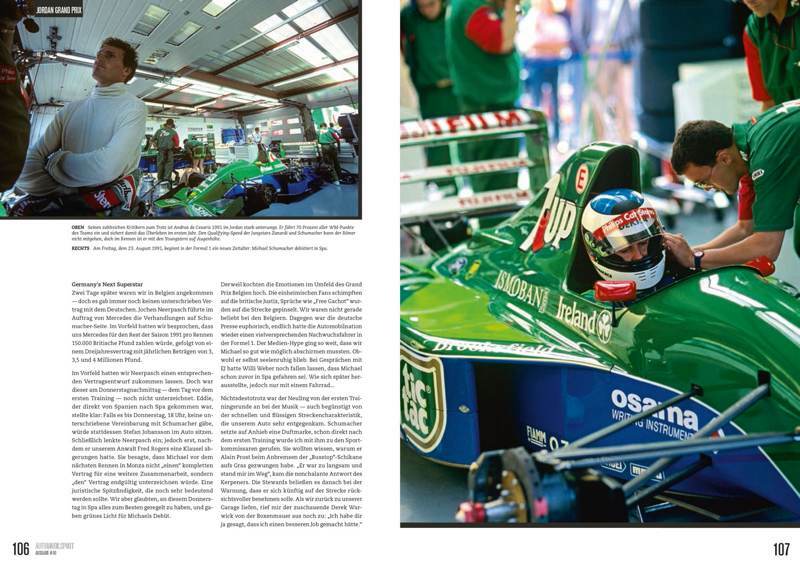 I recognised their faces from old Formula 1 books I read as a kid, and I was rapt that they wanted to help us. We fired up the car and the first thing they said was that "it runs like a Swiss watch". There were some very happy faces in our team – “drive a couple of laps” became “you can do the whole 20-minute practice, but don't go over 8000 revs". That's the point where the 12-cylinder engine should really start to perform, but we needed to be careful and respect their judgment. There was nothing to win, anyway, and enjoying this special experience was always the name of the game. Then it was time to hit the track. The car was started and my pulse began to rise – as did the oil pressure, happily. I selected first gear, let the clutch out, and crawled the Ferrari out of the garage. As I drove through the pit exit into Sainte Devote, the curiosities of Monaco all came flooding back; the flair through the shadows cast by the trees, the strong sunlight on the climb up to Casino, the way it feels like you're in a steel cage lined with barriers, like a lion in a circus ring. Brake before the top, no grip, cold tyres, hold on to the car whatever you do. It was all flying through my head. The twenty minutes of practice fly by. Despite being very cautious, I'm 28th quickest from the 41 cars in the class. But I'm a still a little disappointed, mixed with respect for how brave some of the other drivers are. In the afternoon there is another practice session, and by now all doubts about the reliability are long gone. "Of course we're taking part," says team boss Mario Linke. "But stick to the rev limit." Right before the session light, rain begins to fall. Normally I love driving in the wet, but with this precious car? It's additional pressure I just don't need. All the concerns disappear, however, as soon as I jump in the car. I quickly settle into a rhythm. Unlike the slicks (which were slightly past their use-by date), the wets are new. As the wheels drift lightly out of the corners, I begin to gain confidence in the car at the limit. And it's still a lot of fun. I accelerate out of the Swimming Pool chicane and head off towards La Rascasse in a light powerslide. I turn in, try to find grip, stay close to the inner barrier, step on the throttle again and slide on to the last corner. Even at a mere 8000 to 9000 revs, the 12-cylinder engine sounds fantastic. I have to be careful and read the conditions thoroughly. There are a lot of painted white strips on the road, which make life here very difficult in the rain. You only have to lock one wheel while braking and things can turn nasty very quickly. The others are less circumspect, and quite a few hit the barriers. But I'm nowhere near doing that, even though it might look a little different from the outside. You can kind of end up in a trance when driving around Monte Carlo, particularly with the 12-cylinder engine acting as encouragement. The sound is addictive, especially that blip on the throttle between downshifts. You need to dance on the pedals to shift cleanly – and it's a treat for those listening in from the side of the track as well. First gear out of the old Loews hairpin, through the next right-hander, and then into the tunnel. Who turned on the subwoofer? Who turned out the lights? That's what it feels like in that tunnel. The Ferrari engine screams through the right-hander, the artificial light giving the sensation that you're looking through yellow glasses. 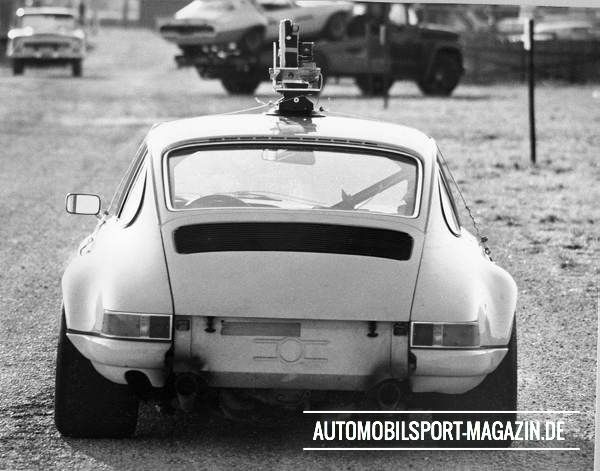 When Michael Keyser started in five races for the 1972 World Championship of Makes with two private Porsche 911 STs, he brought along a camera crew to have himself and the other protagonists filmed. From the resulting footage, he created the motorsport documentary The Speed Merchants and the book of the same title, both classics of their genre. 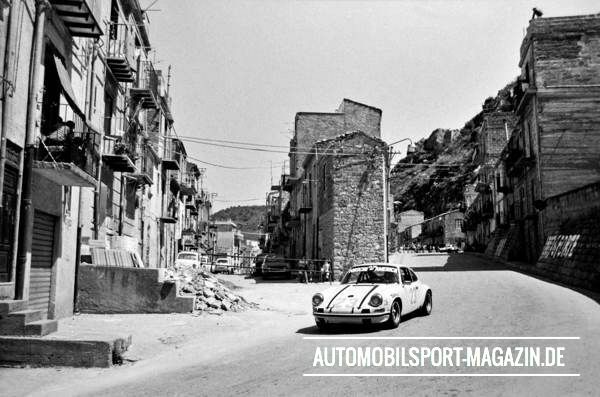 For AUTOMOBILSPORT, Keyser opened his archives and recounts how filming went at the first race in Europe – the legendary Targa Florio. 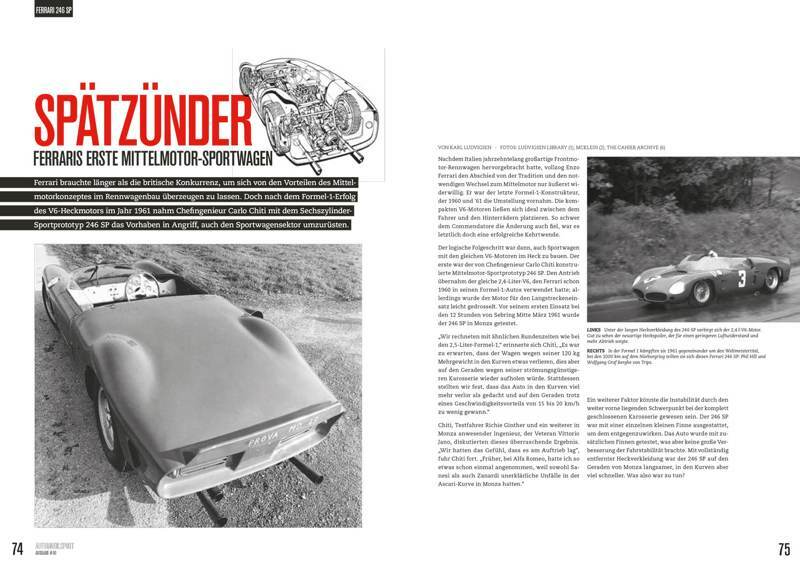 My association with Porsche goes back to the late 50s when I was occasionally allowed to drive my father's red Speedster from the main road to the house. In 1966, the summer after I graduated from school, I was assigned the enviable task of picking up his new 911 at the factory. Three other classmates were in the party, and with two of them behind the wheel of a rented VW fastback, we made a Stuttgart-Strasbourg-Paris-Chartres-Tours-Beaune-Dijon-Geneva-Lausanne-Zurich-St. Moritz-Innsbruck-Munich-Salzburg-Cortina-Venice-Florence-Siena banzai "cultural" run, eventually ending up at our family's summer home on the Mediterranean coast, in Porto Ercole, Italy. 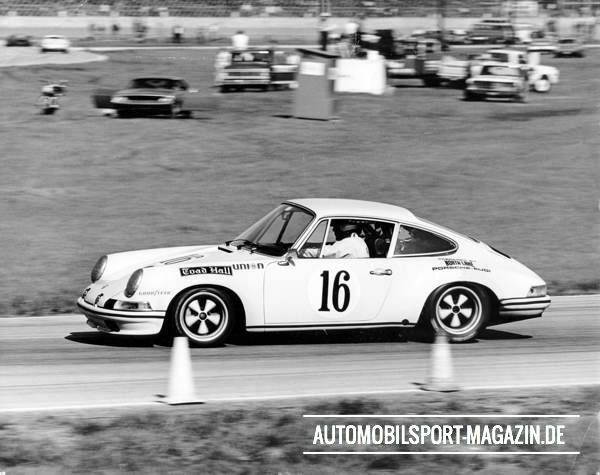 In 1969 a good friend named John Shaw had been at the Sebring 12 Hours and returned to Maryland with a hearty endorsement of the sport of motor racing. 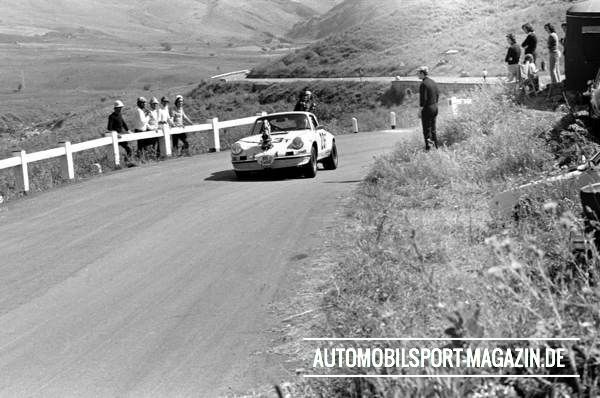 The next thing I knew, the two of us had bought a 1967 911S, converted it for two-litre Trans-Am racing and prevailed on Bruce Jennings to drive it. At the end of the season, I took the car to a PCA event at Marlboro, attended an SCCA school at the same track later that fall and another the following spring at Bridgehampton. There was no looking back after that, and for the next two years, I drove the car under the team name, Toad Hall, in SCCA regional and national events, the first IMSA races, and the Daytona 24 Hours, Sebring 12 Hours and Watkins Glen 6 Hours. 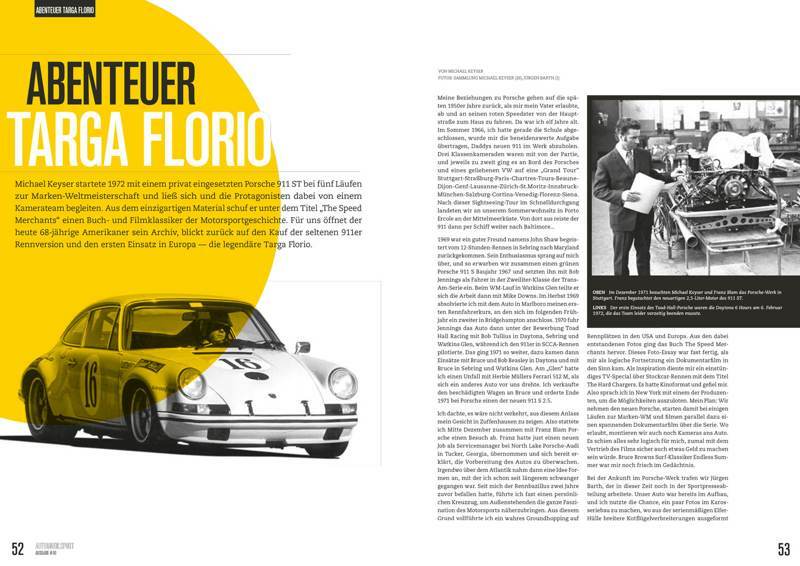 At the end of 1971, the new 2.5-litre cars were introduced by Porsche, and I placed an order for one. Figuring it would be helpful to show my face in Zuffenhausen, I took a trip to the factory in mid-December with Franz Blam. Franz had just taken over as service manager at North Lake Porsche-Audi in Tucker, Georgia, and had agreed to oversee the preparation of the car. Somewhere over the Atlantic on the way to Germany, the idea I'd been kicking around for some time crystallised in my mind. 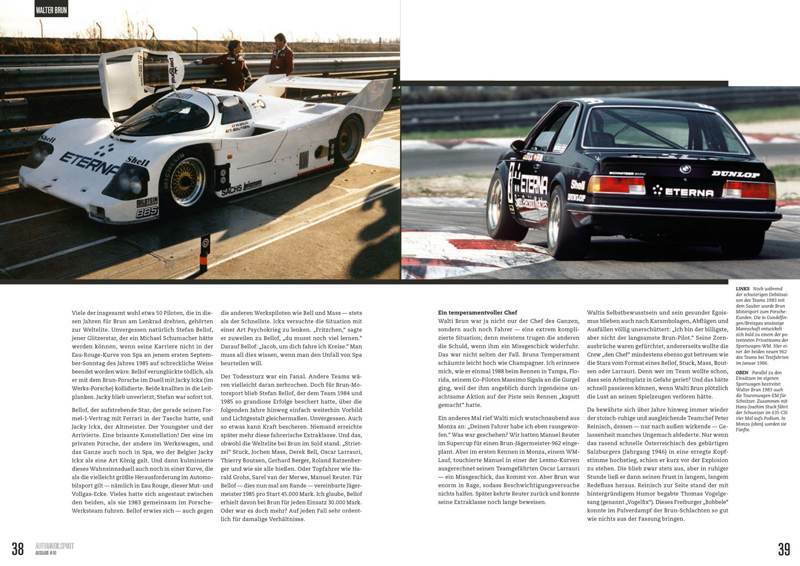 Since being bitten by the racing bug two years before, I'd made it an almost personal crusade to try and explain what a fantastic sport motor racing was to the uninitiated. To that end I'd spent much of that time hopscotching around the United States and Europe, taking photographs for what would eventually be a photo essay on the sport entitled The Speed Merchants. Work on this book was nearing completion, and I thought the logical progression was a documentary film along the same lines. I'd seen a one-hour network television special on stock car racing called The Hard Chargers that had the cinéma vérité look and feel that appealed to me, and had tracked down one of the producers in New York to discuss possibilities. 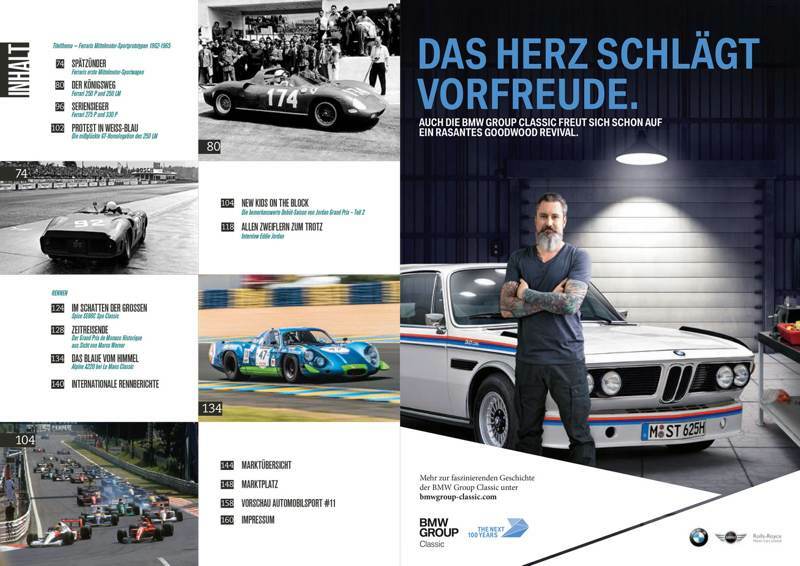 Why not, I thought, take the new Porsche, race it in a number of the Manufacturer's Championship events, and at the same time make a documentary film about the series. Where allowed, I could also use it as a camera car. It all seemed so logical at the time, not to mention that I felt money could eventually be made on the distribution of the film, Bruce Brown's surfing classic, Endless Summer, still being fresh in my mind. Arriving at the Porsche factory with Franz, we were met by Jürgen Barth who was working in what I came to know as the "sports department". Our car was in production and I snapped a few shots of it in the metal shop where wider fender flares were being mated with the stock body. We were also allowed to inspect one of the new 2.5-injected motors. Before leaving I made an offer to Jürgen, who was already following in his late father Edgar's footsteps as a driver, albeit on road courses, not in hillclimbs. Would he be interested in driving with me in some of the races in 1972? I told him about my idea for the film, and his immediate response was positive. We agreed to communicate over the next few weeks, and with that, out the door we went, back across the Atlantic. 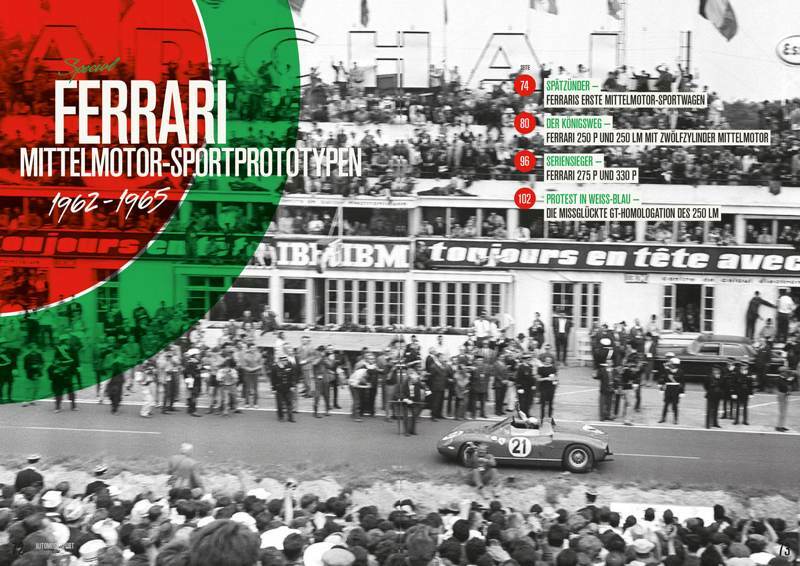 Between the last week of December and the first week of January, I moved ahead with what now seems like mind-boggling speed, assembling an entire New York-based film production crew and making plans to both race and film at Daytona, Sebring, the Targa Florio, the Nürburgring, Le Mans and Watkins Glen. 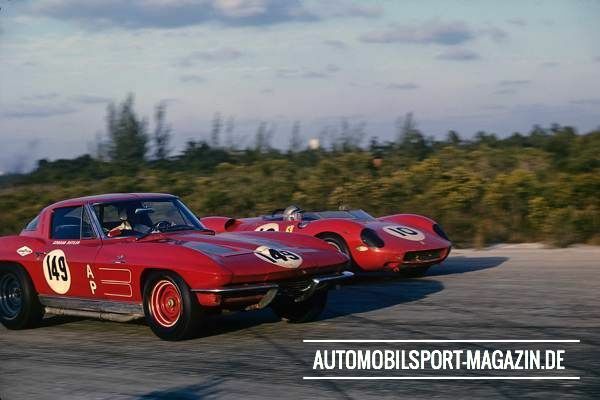 I'd already asked Bob Beasley of Richmond, Virginia, to drive with me at Daytona, which was a 6-hour event that year, but Jürgen agreed to come on board at Sebring and co-drive in the remaining events. We ran into problems at Daytona and DNFd, but the weekend wasn't a complete loss. Hans Mandt, who had worked for Peter Gregg for a number of years, decided to abruptly part company with him and before the race was over, Hans agreed to come to work with me. Franz, whose job at North Lake would have prevented him from making the trip to Europe, graciously stepped aside. Working out of the garage at his house in Jacksonville, Hans prepared the car for Sebring. Being a member of the PCA, I decided to run a Porsche Club of America windshield sticker in all the international events, which we did. The rough Sebring airport circuit took a toll on something that escapes my mind, and again we DNFd, this time Jürgen and I driving together. 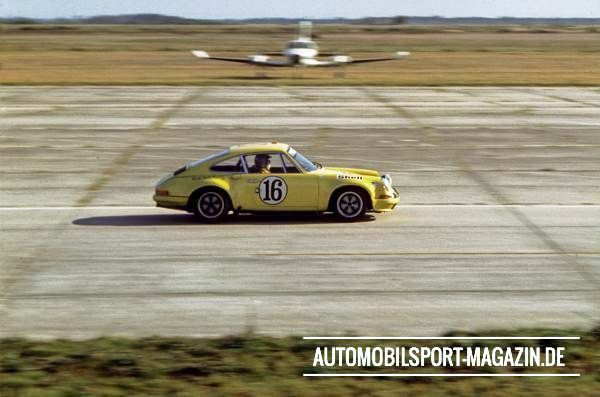 After filming the first race at Daytona with a small crew, including shooting some footage from the race car, Toad Hall Productions, as the company was called, launched an all-out assault on Sebring. I can't remember the exact number in the company's employ, but there must have been 30 or more "toads" poking cameras and microphones in every nook and cranny of the airport circuit. 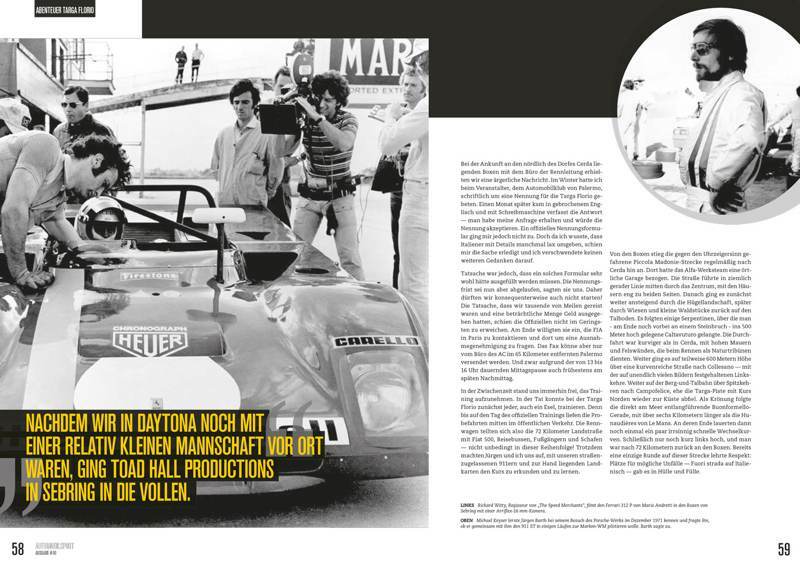 Before the Daytona event, I'd written personal letters to all the team managers and principal drivers for Ferrari, Alfa Romeo, Lola and Mirage explaining what it was I was trying to accomplish by making the documentary film, and enlisting their help. Basically, I asked them to "act naturally" when they saw us lurking around. To our pleasant surprise, we found most of them were genuinely interested in helping, not the least of whom was Peter Schetty, the Ferrari team manager. We'd received permission from him for one of our camera crews to place lights around their garage in anticipation of shooting the engine changes on the night before the race and other preparations of their three-car team. The camera crew hadn't finished mounting the lights when the Ferrari mechanics were ready to leave for dinner, so amazingly Peter handed the keys to the garage to the production manager, told him to lock up when they were finished and bring them to him at the restaurant where they'd be eating! 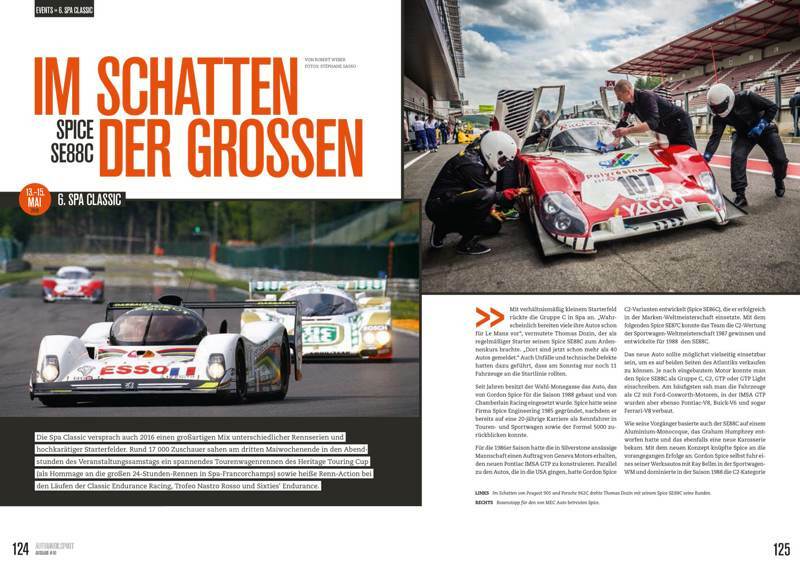 With his squad Brun Motorsport, Swiss driver turned team boss Walter Brun set new standards in the German Racing Championship and the World Sportscar Championship. He employed some of the best racers of his time, including the great Stefan Bellof, who sadly also lost his life in a Brun Porsche. But “Walti” overcame that cruel twist of fate as he later did his failure in Formula 1 and subsequent bankruptcy. 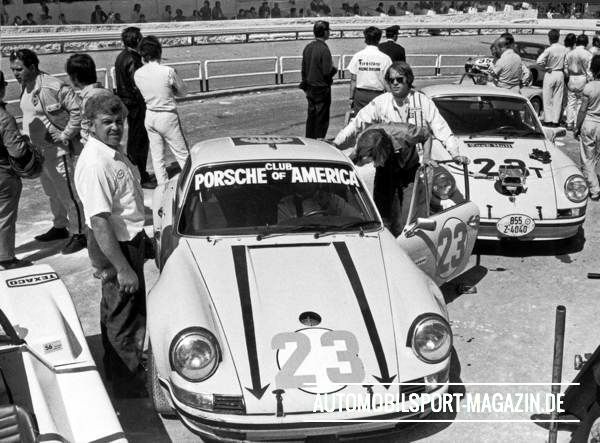 He was temperamental, generous and utterly unorthodox – even introducing his two wives to legendary company patriarch Ferry Porsche. Eckhard Schimpf recounts the tale of a friend who always went his own way. These days, motorsport – and Formula 1 in particular – is cold and sterile, like an intensive care unit. It’s all about the sums, and corporations, be they manufacturers, suppliers, or sponsors, have all the say. The drivers are highly-paid professionals, who maintain a sense of discipline regardless of the situation. The fun has somehow been lost along the way. The days of characters, the ones that made motorsport personal and relatable, are 30 years in the past. Back then, in the 1970s and 1980s, there were still colourful personalities. And Walter Brun was one of them. Tall, slender, jet-black hair, and a pin-stripe moustache. He would have been the perfect fit for a pirate movie, or even a Western. I can still picture the way he rolled into the paddock for the first round of the European Hillclimb Championship in Draguignan in the South of France in 1975; a Range Rover as tow car, a three-litre Schnitzer BMW CSL on the trailer, a slim, beautiful woman with blonde hair down to her backside in the passenger seat, and a German shepherd dog on the back seat. Walter Brun, born in Lucerne in 1942, began his working life in a pretty ordinary way. He started an apprenticeship at the postal service on the advice of his mother, but it didn’t come to much following his civil service. Instead he began to set up his first gaming machine, which would later become hundreds of gaming machines. He also opened a night club, worked as a champagne dealer, and began to, rather successfully, compete at hillclimb events. 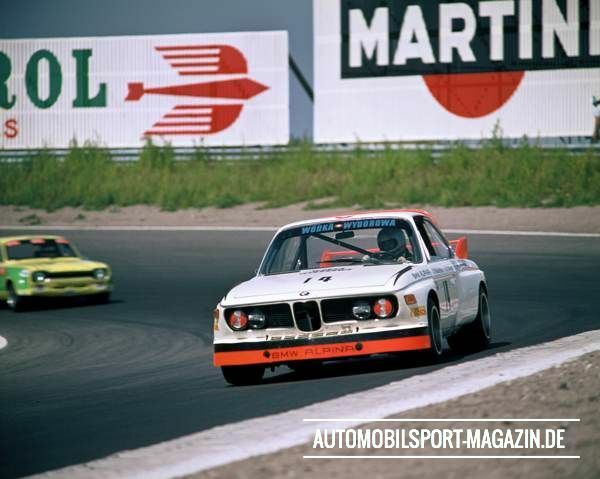 In 1971, he won the European Championship in a Schnitzer BMW. 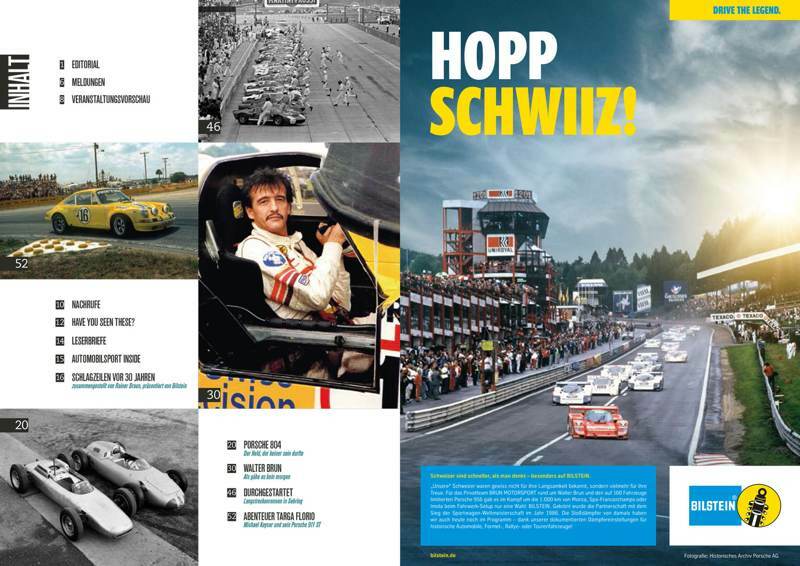 The Swiss would go on to race touring cars and sports cars, he’d hire drives or would buy his own car and have it operated by proper outfits like Schnitzer, Heidegger or GS. 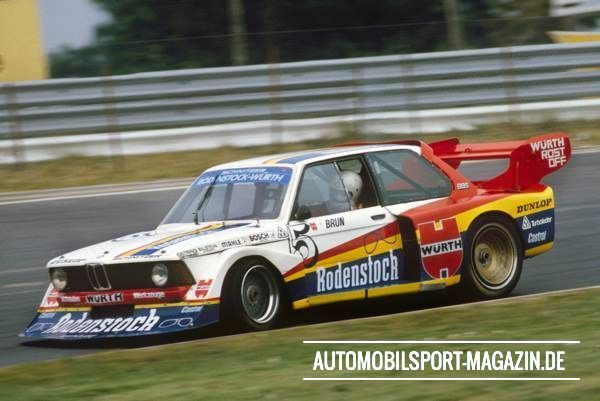 He regularly raced a BMW in the DRM (German Racing Championship) and in the European Touring Car Championship, as well as running an M1 in the Procar Series and long-distance races. 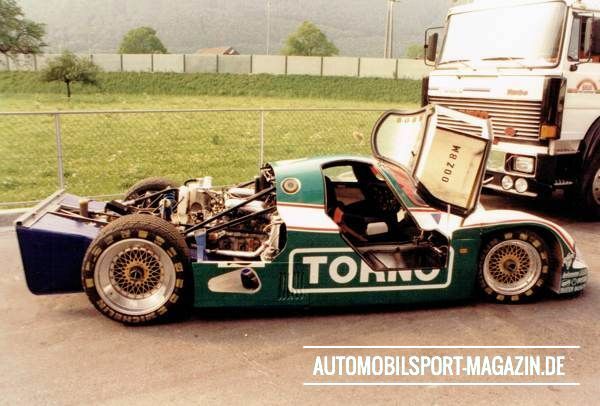 Competing in Group C, he had a serious crash at the 1000-kilometre race at the Nürburgring in 1983, his car bursting into a thousand pieces at the ‘Karussell’. The driver walked away unharmed. Brun took the odd win here, backed up with the odd podium there. But all-in-all there were no real standout victories. 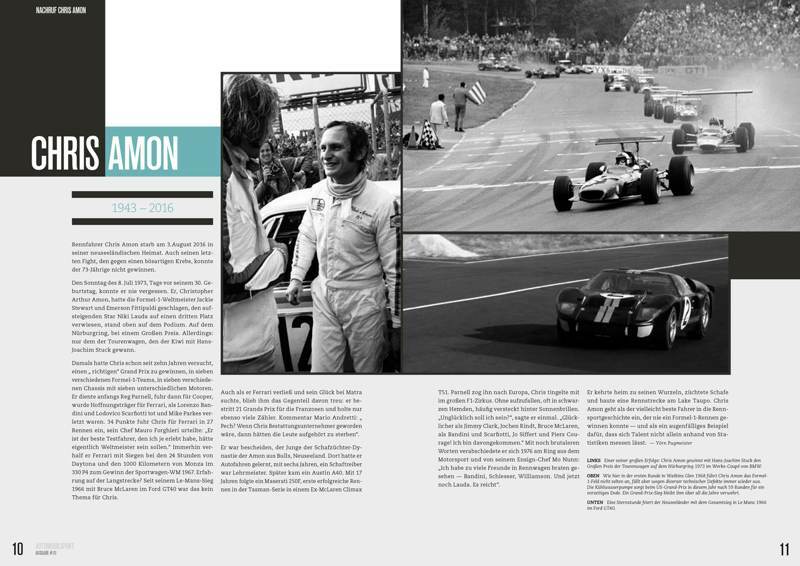 Still, he started around 500 races, all over the world. 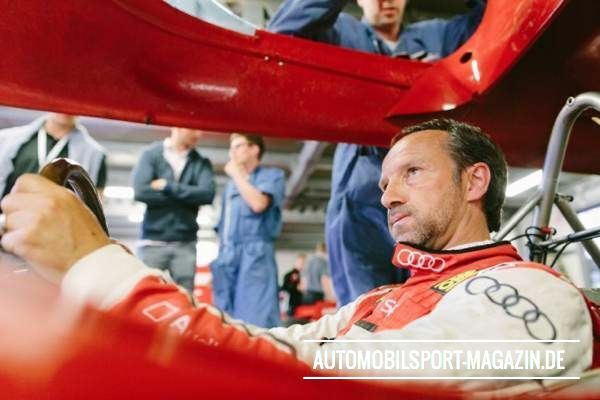 His last was as a guest driver at the GT Masters round in 2009 at the Lausitzring. 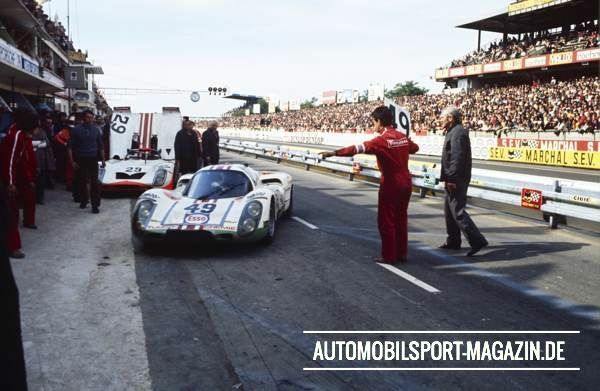 He raced at Le Mans 14 times; in 1971 he won his class and was seventh outright in a Porsche 907, and in 1984 he was fourth outright in a Porsche 956. He was a real racer, a daring battler. 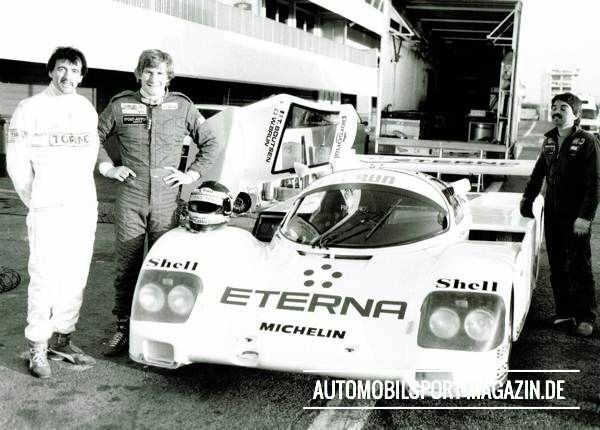 He was a good racing driver, who took on the world’s best – usually in 700 to 800 horsepower cars like the Porsche 956 and 962. And he was only ever an amateur, as he always worked full-time as an entrepreneur… and a clever one at that. Still, racing was always his life. Suddenly, at the beginning of the 1980s, there was a turning point. Brun became a team owner, after buying the prestigious, but financially troubled, GS racing team from Gerhard Schneider. 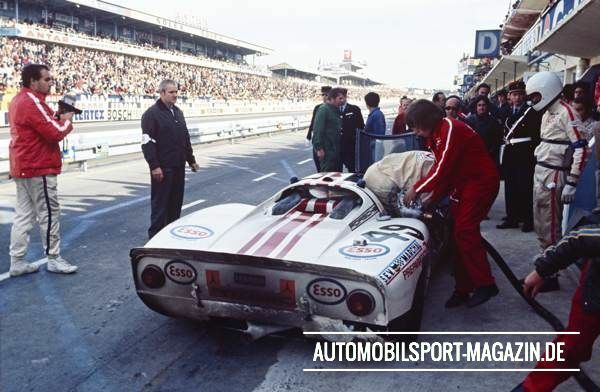 It quickly became Brun Motorsport, and for nearly two decades it was one of the top teams in endurance racing. 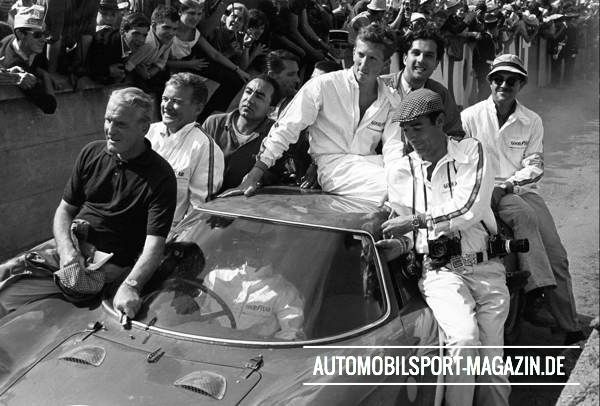 And success didn’t just come in Europe, at places like Monza, Spa, and the Nürburgring, but all around the world, in Miami, Fuji, Mexico City, Daytona, and Kyalami. 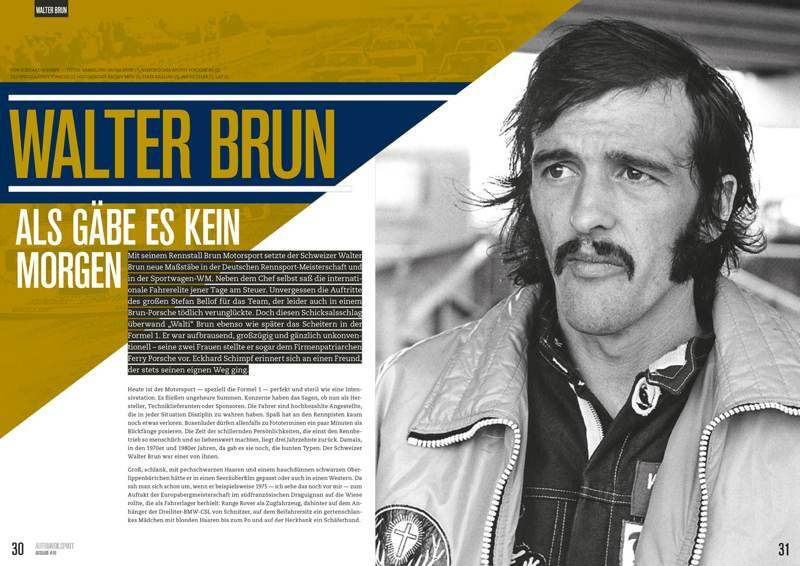 As I was “Jägermeister’s man in motorsport”, I have a special connection to the Brun team. 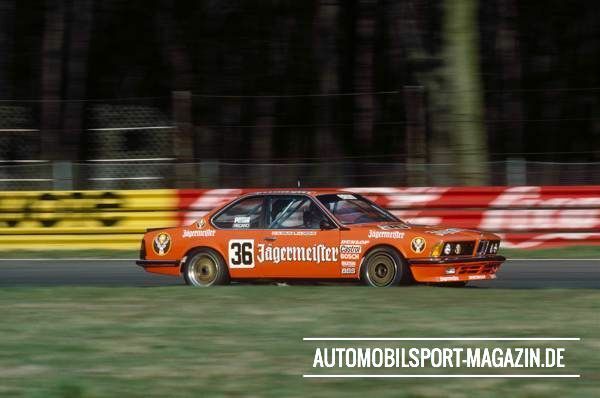 After all, Jägermeister spent seven years, up until 1990, as one of Brun’s sponsors. I remember signing the first contract with Brun in Freiburg, on the 14th of January in 1984. 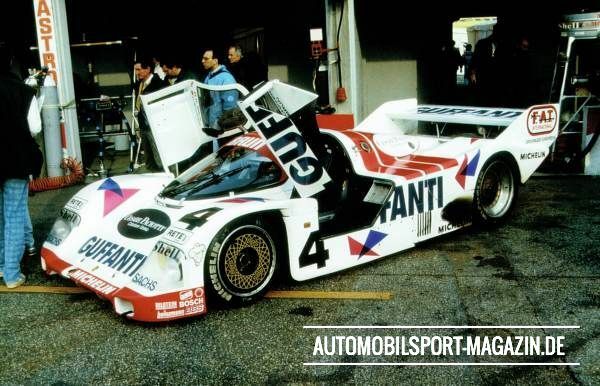 Stefan Bellof and Hans-Joachim Stuck were to race a Porsche 956 in the DRM and selected long distance races. 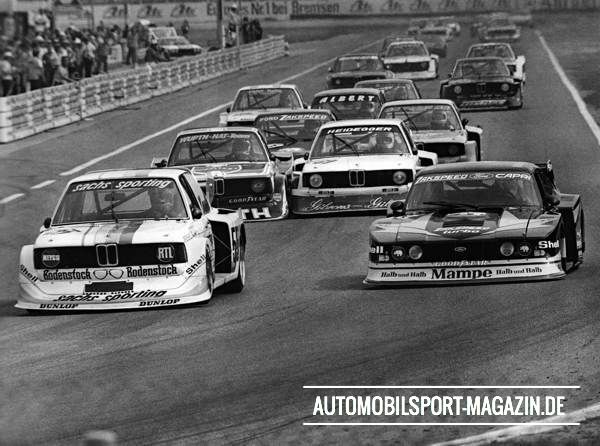 Stuck was also set to mount a title challenge in the newly-created ‘Deutsche Tourenwagen Meisterschaft’ in a BMW 635 CSi.